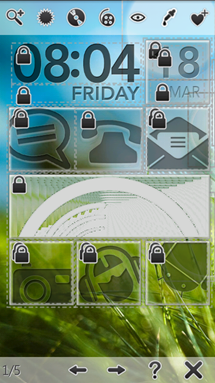 Launcher Wall is an interactive live wallpaper comprised of customizable, animated tile-style icons with an animated background. It is pretty straightforward; each tile corresponds to a user defined app in which you can change the size, placement, angle, size, transparency, and animation. At the time of writing this, there is no way to change the tile image or disable all animations, so expect to see some movement even if the animation is turned all the way down. 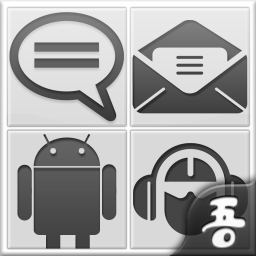 Naturally, one of the first things that you will want to do after installing this app is customize it. 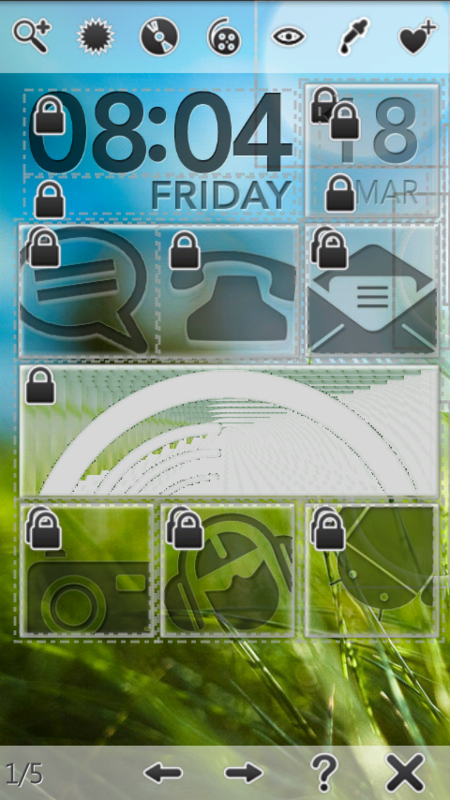 Some of the tiles have pre-assigned apps attached to them, such as phone, messages, and gallery, which is represented by a nifty slideshow-style tile. 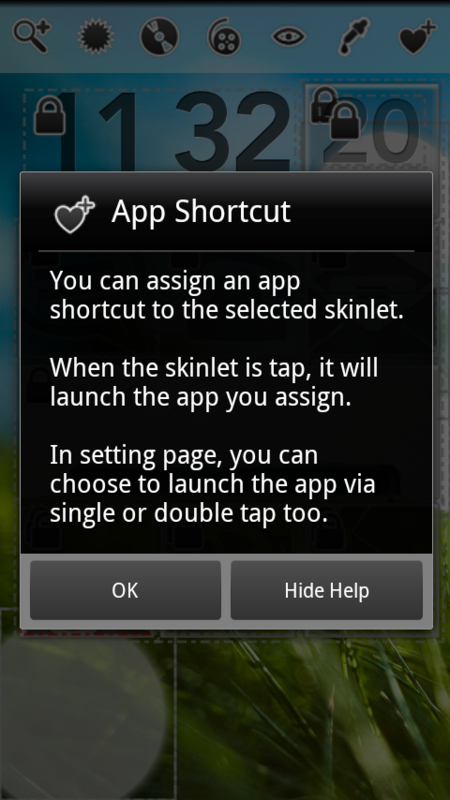 For the others, all you have to do is tap the tile and it will you the opportunity to assign an app shortcut at that time. 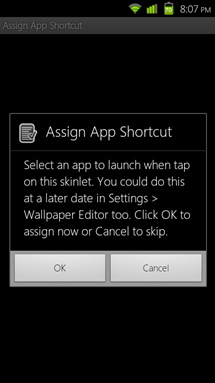 If you want to change a pre-assigned tile, decide not to assign a shortcut, or accidentally hit cancel, don’t worry – you can change that later. Inside the “Wallpaper Editor”, simply tap the tile and change the app shortcut from there (the heart icon in the toolbar). 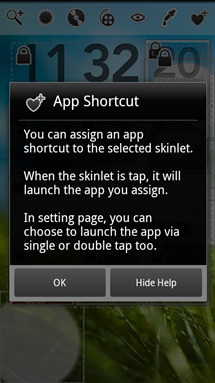 In the settings menu, you can choose to launch apps with a single tap (default) or a double tap. The latter could prove to be useful for those that constantly hit their screen and launch apps by accident. 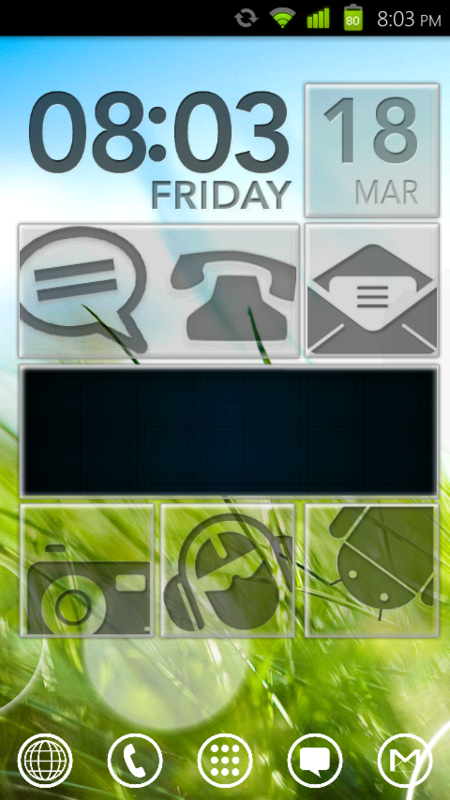 You can also customize the background, which works a lot like changing the wallpaper. This is where I experienced my first bug – when selecting the background image, you are given the option to crop it, just like when setting a custom wallpaper. 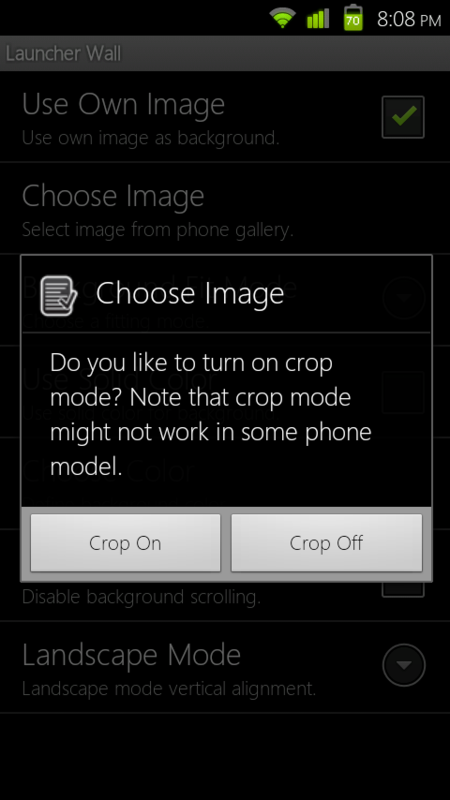 However, each time I chose to crop the image, the app crashed. No force close dialog, it just died; if I chose not to crop the image, it worked fine. The customization doesn’t end here, though. In the “Wallpaper Editor” you can change the placement of the icons, toggle visibility, remove the outlining border, and more. This is by far the heart of the application. You will most likely spend more time in this interface exploring the different options and customizing the look than anywhere else. The customization process is somewhat tedious, however. Each time you want to change anything about a tile, you must first tap it, choose the appropriate editing tool - resize, transparency, rotation, animation, visibility, or color filter - and apply the action. For example, if you rotate an image too much, you must go through all of the steps again in order to undo or change the action once it has been applied. At this point, you’re probably saying to yourself “all of these features and customization options are nice to have, but at what cost?” You get to choose! Do you want the app to perform, and thus look, better? The developer has included an option to change the level of performance that you want. Of course, the better the performance, the harder the impact on battery life. This brings me to the first major drawback of this app – battery use. During testing, I ran this app for a full day, in which I had to charge my phone three times. It ran my battery down from 100% to 15% in about 4 hours, and that was with the animations set to the lowest level and the performance level on the recommended setting. Unfortunately, the downfalls don’t stop there. This app ran so poorly on my phone - an original Motorola Droid (overclocked to 1GHz) - that I had to switch the testing to my fiancée’s Droid X. 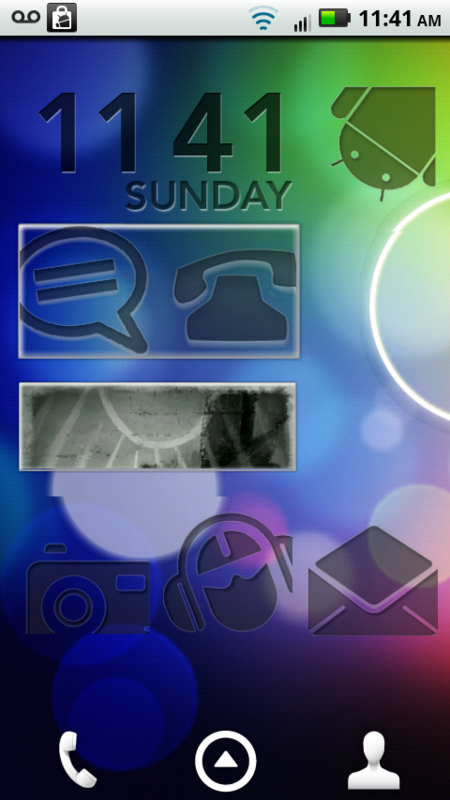 The X showed a vast improvement over my OG Droid, proving that this app is not meant for older hardware. Another “feature” of this app is that it makes a terribly annoying sound each time you tap an icon or shake the phone. Why anyone would want this is a mystery to me, but for the good of humanity, it can be easily turned off. After running this app for about a day and a half on two different phones, I can safely say that it’s not for everyone. It uses an unbelievable amount of battery at this point and is very sluggish on older hardware, but if you’re really into eye candy and have the hardware to back it, then I say go for it. Otherwise, I would say give it a try, but be prepared for battery compromises and, as a result, a certain level of disappointment.